કોણ કહે છે કે પેલો માંસાહારી છે? પેલો તો શાકાહારી છે, પણ માંસાહારી વાનગીઓ ઉપર પણ હાથ મારે છે. પહેલાંના જમાનામાં રાજાઓ હતા. અને તેઓ કહે તે કાયદો ગણાતો. પણ પછી તેના ઉપર નિયમનો આવતા ગયા. પહેલા રાજસુય યજ્ઞો સારા ગણાતા. હવે ન ગણાય. હવે યુદ્ધો પણ સારા ગણાતા નથી. જોકે યુદ્ધો નિવારી શકાયા નથી. પણ યુદ્ધ નિવારવાના સામુહિક રાજકીય પ્રયત્નો થાય છે. ટૂંકમાં યુદ્ધ નિવારણ એ એક હિંસા નિવારણ તરફનું જ કદમ કહેવાય. 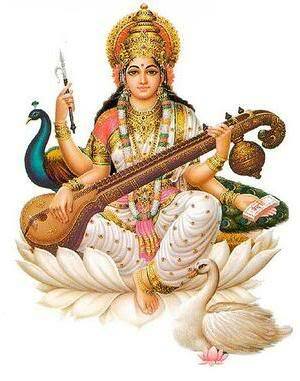 છતા આપણે દંડને સાવજ અનિવાર્ય માનતા નથી. કારણકે દંડનો હેતુ માનવના મનને સુધારવાનો છે. જો આપણો વ્યવહાર ઉચ્ચ કક્ષાનો હોય કોઈને પણ વાગ્યાનું આપણા ખ્યાલમાં આવે તો પણ આપણને દુઃખ લાગે. શારીરિક દુઃખનું જેવું છે તેવું જ માનસિક દુઃખ વિષે છે. આ સંવેદનશીલતાનું વર્તુળ માનવના માનસિક વિકાસની સાથે મોટું ને મોટું થતું જાય છે. બૌદ્ધિક વિકાસ, ભૌતિક વિકાસ અને માનસિક વિકાસનો વેગ એક સરખો હોતો નથી. કારણ કે તે સામાજીક જરુરીયાતો ઉપર પણ અવલંબે છે. એટલે ગાંધીજીએ કહેલું કે જે લોકોએ વેદ અને ઉપનિષદ લખેલા તેઓ યાંત્રિક વિકાસ માટે સક્ષમ ન હતા તેમ માનવું જરુરી નથી. પણ તેઓ પર્યાવરણ અને માનવસમાજની તંદુરસ્તી બન્નેને એક્બીજાના પરિપેક્ષ્યમાં સમજી શકેલા. માણસના આહારની ટેવો આમ તો તમે જેવી પ્રેક્ટીસ પાડો તેવી પડે. “ભૂખ ન જુવે ભાખરી..” ગાંધીજી વિલાયત ગયા એટલે તેમને લાગ્યું કે આહારની ટેવો આપણે બદલી શકીએ છીએ. ગાયને પણ રાંધેલુ માંસ ખાતી કરી શકાય છે. અને સિંહને પણ રોટલા ખાતો કરી શકાય છે. આલસેશ્યન કુતરો પણ રોટલા અને દૂધ ઉપર જીવી જાય છે. બિલાડી પણ અન્નાહાર કરે છે. કુતરા, બિલાડા, સિંહ, વાઘ વિગેરે એક જ કક્ષાના પ્રાણીઓ છે. હવે આપણા શરીર માટે શું જરુરી છે એ વાત આપણા શરીર પોતેજ કહે છે આપણા માટે શાકાહાર જ યોગ્ય છે. માણસે અગ્નિની શોધ કરી તેથી અને શાકાહારના અભાવમાં તે માંસાહાર કરતો થયો. પણ જેમ જેમ તેની સંવેદનશીલતા વધતી ગયી તેમ તેમ તે અમૂક પ્રાણીઓને ત્યાજ્ય ગણતો ગયો. ભારતમાં ગાય ગણાઈ. ધીમે ધીમે જ્ઞાની જનોએ સંપૂર્ણ શાકાહારની વાત કરી. શાકાહારમાં પણ અન્ન, ફળ, મૂળ અને પર્ણ ના ભેદ પડ્યા. મૂળમાં રનર-ટાઈપ મૂળ સ્વિકારાયા, કારણે કે તેમાં વનસ્પતીનો સંપૂર્ણ હ્રાસ થતો નથી. પણ પર્ણ ને રાત્રે ન તોડવા તેવું સ્વિકારાયું. ફળમાં રસાદાર ફળો સ્વિકારાયા. અને બીજ ને ફાલવા દેવું. અન્નને અગિયારસ, અને દેવ-સેવાના મુખ્ય તહેવારોમાં ન ખાવા તેની પાછળ પણ સંવેદન શીલતાનું ગણિત જ કામ કરે છે. જેમ મંગળવારે કે શનિવારે માંસાહારી લોકો ભારતમાં માંસાહારને ત્યાજ્ય ગણે છે. વાસ્તવમાં ક્યાંક તો એક સીમા આવે જ છે. આપણે ગાય સાથે આત્મીયતા છે એટલે ગાય ખાતા નથી. યુરોપીયનોને કુતરાસાથે આત્મીયતા હોય છે તેથી તેઓ કુતરાને ખાતા નથી. કોણ કોની પ્રત્યે સંવેદનશીલ છે તે મહત્વનું હોય છે અને આખરે તે જ ભાગ ભજવે છે. કૃતજ્ઞતા એ એક સંવેદનાનો હિસ્સો છે. ગોસૃષ્ટિના માનવજાત ઉપર ઉપકાર છે, વનસ્પતિ સૃષ્ટિના પણ માનવજાત ઉપર ઉપકાર છે, અને તેથી આપણે તેમની પણ પૂજા કરીએ છીએ અને તેમનો વિવેકપૂર્વક ઉપયોગ કરીએ છીએ.અસ્ત્ર શસ્ત્રોની પણ આપણે પૂજાકરીએ છીએ. આ બધું આપણી સંવેદનશીલતાનું દ્યોતક છે. ઘાસ ખાઇને જંગલના હાથીઓ બળવાન થાય છે, પવનમાંથી સર્પો ભોજન કરી લે છે, કંદ અને ફળો ખાઈને મુનિઓ જીવન વ્યતિત કરે છે. સંતોષ એજ તારણ છે. અગાઉ વેદોમાં અહિંસાની વાત કરેલી. Once in 1977 Atal Bihari Bajpai opined that he had fallen in love with Morarji Desai. This was mainly because he was successful in organizing the opposition leaders who really concerned to fight against the autocracy of Indira Gandhi and her disgraceful and disrespectful behavior towards rule of law. That was a period where the people had not forgotten the Nagarwala case of lifting a cash 60 lakhs rupees from a SBI branch, on phonic instruction of Indira Gandhi, and then the case was dispose off within 24 hours by the court without calling Indira Gandhi at the witness box. Thereafter mischievous disappearing of the CBI Inspector and Nagarwala from the world. This is a secret till this date. That was a period where the people had not forgotten the frauds generated through Nationalization of leading 14 banks. This was a period where the people had not forgotten the reasons quoted by Indira Gandhi for justifying the imposition of emergency. This was a period where the people had not forgotten the censorship imposed by Indira Gandhi where publication of judgments of High Court were even banned if they were against the government. This was a period where the people had not forgotten the free style arrests of even Gandhian people who opposed her self centered approach and greed of power at any cost of the Nation and moral values. You can write a book comparable to the thickness of the book of Maha Bharat. To raise the Nation from the anarchy we had three great personalities. One Jai Prakash Narayan and JB Kriplani and the third was Morarji Desai. Morarji Desai was defamed, ridiculed and insulted by Nehruvians. No media had supported his claim on PM-ship on the ground of seniority or whatsoever. In 1962 some media demons were deadly against Morarji Desai especially those who were committed to Nehruvian or pro-communists or with western stooges. For that reason even some vernacular columnists too had adopted to follow the same line. It was the moral principal of Congress and its fellow members to follow the decisions taken in party whole-heartedly and then to stick to it. E.g. Congress had accepted that the independence has to be achieved through non-violence. However a person who had no faith in Non-violence had been elected as the party president. As per the constitution, the party president can hold the post till he enjoys the support of members of its working committee. Mahatma Gandhi indicated that the election result does not support the principles of the party line on the independence movement. He further said, “ … hence those who support the party line for independence should resign.” And this caused the resignations of all the members of working committee who supported line of action of Mahatma Gandhi. It was the moral duty of Subhashchandra Bose to resign. And he resigned. (Had it been Indira Gandhi in place of Sub hash Chandra Bose she would have continued). It was a policy decision to have three states just like state committees of Congress Party. Viz. Maharashtra, Mumbai and Gujarat. But people of Maharashtra wanted a separate state. The line of action of the party was either to have the old Bombay Provincial state or to have three states. Morarji Desai stood by the party policy. But Nehru created a controversy that Bombay historically established by Gujarati people but majority percentage belongs to Marathi people hence there is dispute as to where the Mumbai should be attached? (In fact Gujarati people had never demanded Bombay nor by Gujarati leaders) In spite of this Nehru made a public statement that he would be happy if Maharashtra gets Bombay. This had generated an impression among Marathi speaking people that it is Gujarati speaking people who want Bombay with them. This had further generated terrors on Gujarati people in Bombay and temporary forceful migration of Gujarati people from Bombay, though till centuries Gujarati and Marathi used to live together peacefully. Nehru was the founder of dividing people politically by languages in India for his own personal gain, whereas Morarji Desai had always opted to stick on the once decided party principles and line. 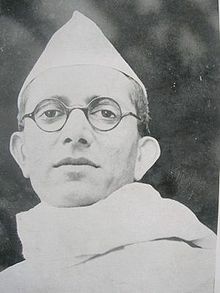 Resultantly Morarji Desai became un-popular in Gujarat. Nehru already had made him un-popular in Bombay. Morality goes with Morarji Desai. In 1964 Morarji claimed for PM-ship consequent to the death of Nehru. The majority supported LBS. Morarji accepted it. In 1965 Morarji claimed for PM-ship consequent to the death of LBS. He said he was senior. The stooges of Nehruvians had said no he was not senior. Because once upon a time Indira Gandhi had been the party president, and thereby Morarji Desai had deemed to be worked under her. Indira Gandhi had never worked under him. This was in fact a funny argument. The syndicate formed by Nehru was afraid of Morarji Desai. This was mainly due to nature of Morarji of sticking to the principles like Mahatma Gandhi. Morarji Desai was of the opinion that the decision should be taken carefully with deep study of the case. Thereafter the party should not deviate from the decision taken. Nehruvians were never interested in firm and foresighted policies. Their policy was linked with politics of power by any means and not to educate and guide the people. Indira Gandhi was a failure in governance. The syndicate thither to supported her was no longer to support her for next term. Hence in 1969 Indira Gandhi supported V V Giri’s candidature against her own party’s candidate Sanjiv Reddy whose nomination she herself had filed. At this stage Morarji Desai had suggested to dismiss Indira Gandhi from the party. Had Morarji Desai’s suggestion been followed, the history of Congress would have been different. But syndicate members were opted to postpone the execution of such action. Because they were of the opinion that inspite of Indira’s support to V V Giri, the Congress nominee could win the election. Morarji wanted not to take any risk. 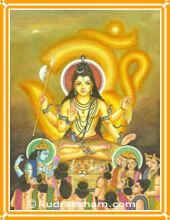 This was mainly the victory of V V Giri might cause the changes in the faith of the members including ministers. And the same thing happened. Though the Congress lead by Kamraj had full organizational support the majority MPs turned their faith towards Indira and backed Indira Gandhi in Congress. For maintaining the majority in the parliament Indira took support of CPI and CPIM. Indira Gandhi passed whole blame of failure of her own governance and her father’s governance upon the old leaders of Congress. Media and learned political analysts applauded in favor of Indira Gandhi. During this period she nationalized all the 14 leading banks and abolished privy-purses of the former kings to become popular. Though former was a calculated fraud for using public money for party politics. In fact Morarji Desai had introduce the principles of socialization of banks instead of nationalization of banks so that the banks could act and remain with sense of responsibility. As for Indira Gandhi as a part of Nehruvian culture, the responsibility was to be taken as the terms of philosophical lectures. Some how or other and despite of clear and absolute majority, Indira proved herself a total and all level failure in governance by 1973. People’s agitation was launched in Gujarat. The CM had to resigned. But the agitation was not to end the Congress rule in Gujarat and therefore the agitation went for dissolution of the state assembly. Many MLAs had resigned. Even then Indira Gandhi was not becoming ready to dissolve the state assembly. MORARJI DESAI WENT ON INDEFINITE FAST TWICE: Though some people thought the fasts for a political gain. But Morarji Desai very well knew the mind of Indira Gandhi and her tactics. Therefore Morarji Desai went on fast till death to see that Indira Gandhi dissolves the state assembly without further delay. This generated a great pressure upon Indira Gandhi from veteran Mahatma Gandhian leaders and thereby from the public. Morarji Desai again went on indefinite fast for establishing popular government in Gujarat. As per the Nehruvian culture, Indira Gandhi was not readily agreeable to conduct assembly election. She was busy with dividing people by castes and creed in Gujarat. This was a dangerous game of Indira Gandhi to harm the nation for a long term. In view of this Morarji had no option but to pressurize Indira Gandhi to conduct state assembly election. And again he went on indefinite fast. Indira Gandhi had no option but to conduct election. Because otherwise the party was to be a total zero in Gujarat. Indira’s Congress had lost the state assembly election in Gujarat in early 1975. Junta Front Government came to power under the leadership of veteran Mahatma Gandhian leader Babubhai Patel who was a simple and highly honored leader. There were court cases against Indira Gandhi on her unfair means of canvassing in parliamentary elections. To hide the visible failure she started to blame the opposition. She imposed emergency and put all opposition including veteran Mahatma Gandhian people behind the bar for indefinite period. The media stooges had realized their mistakes (hitherto glorifying Indira) but it was a stage they had left with no moral courage to oppose Indira Gandhi. They simply surrendered to emergency. Any way you cannot bury the truth eternally. Indira Gandhi’s emergency was proving itself a failure on its own burden. India lost its own democratic dignity. Indira had no option but to declare election. Indira got defeated. Junta Front government under the leadership of Morarji Desai took the rein. It was a good government. Prices had been brought down. Morarji Desai ministry first of all made necessary amendments to the Indian Constitution so that no successor government can impose emergency. In case any emergency is inevitable than only parliament had to approve it first with absolute majority. These were enough to prevent a mad leader to take the nation for granted. The other positive points of Morarji government were to remove all restrictions on productions. 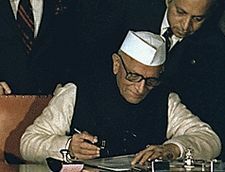 Morarji Desai had also standardized the appointment of pay commissions at pre-fixed intervals, determination of price index at regular interval, payment of dearness allowance based on price index at regular interval of six months, merger of dearness allowance with basic salary at regular interval. BUT ANYTHING CAN HAPPEN IN INDIA WHERE THE ELITES ARE IDIOTS AND MASS IS ILLITERATE!! Principle and morality is ok so far you’re in some suitable part of India. But in Bihar or UP or else where it may not work. Charan Singh started making some noise. He wanted to become PM at any cost like Nehruvians. Because he belonged to a state to which Nehru and Indira belonged. Morarji Desai removed Chaudhary Charan Singh from the cabinet. But Jan Sangh leaders requested and assured that Charan Singh would not repeat his mistakes. Had Morarji stuck to his own decision the history of India would have been different. But Morarji Desai had believed in joint leadership as a part of democratic values. He was not autocrat like Indira Gandhi. For the said decision not only Junta Front or its leaders had to suffer but whole nation was put to a prolonged anarchy, which was poised subsequent to the fall of Junta Front Government. CHARAN SINGH BETRAYED MORARJI DESAI, INDIRA BETRAYED CHARAN SINGH Charan Singh betrayed Morarji Desai again. He took support of Indira Gandhi’s Congress and put an end to the Junta Front Government. Indira Gandhi betrayed Charan Singh. She managed with Sanjiv Reddy. And got the parliament dissolved. Media supported Indira, as now there was no fear of emergency in future due to constitutional amendments. Indira Gandhi supported Bhindaranvale for political personal gain. Consequently India faced terrorism of Khalistani leaders. Pakistan terrorists followed them as they were waiting to penetrate India some how. We talk of Sardar Patel who died a little earlier. But we failed to support Morarji Desai who was young till he died at the age of 99 years. He said 99 or 100 has no any relevance unless we have decimal system of counting numbers. At the very old age the brain of many stops functioning. But here a man at 99 says he was not in three digit years of age due to decimal system. It is not important whether you live for 100 or 99. Many people dies early due to their monkey character. Let us submit our tribute to this Morarji Ranchhodbhai Desai the first Non-Nehruvian PM of India, the best PM of India and one of the last Mahatma Gandhian on his birth date, which comes only after 4 years i.e. 29th February. To day is 28th February. HE LIVED A PURE LIFE. અંધારા ઓરડામાં કાળો ભૂતીયો બિલાડો અને બ્રહ્મજ્ઞ રજનીશ આમ તો મુહાવરો એમ એ કે “અસ્તિત્વ ન ધરાવતી કાળી બિલાડીને અંધારા ઓરડામાં શોધવી.” કાળો ભૂતીયો બિલાડો બીલાડો એટલે શું? કાળો એટલે બધા રંગો શોષી લે. ભૂતિયો એટલે અસ્તિત્વ ન ધરાવતો અને બિલાડો એટલે બિલાડીને બદલે બિલાડો. અને બ્રહ્મજ્ઞ એટલે શું? સૌપ્રથમ આવો અંગ્રેજી ટૂંકાક્ષરી શબ્દ હતો એલજીવીજી. એટલે કે લાગવગ. ગુજરાતીમાં એક નવો શબ્દ પ્રચલિત થયો છે જે છે “એમ.બી.એ.”. “એમ” એટલે મને. “બી” એટલે બધું. અને “એ” એટલે આવડે. મને બધું આવડે એટલે એમબીએ. એમબીએની જ્ઞાતિનો એક શબ્દ છે સબબંદરકા વ્યાપારી. એટલે કે તમે જે કંઈકામનું નામ લો તે એ કરી શકે. બ્રહ્મજ્ઞ એટલે તમે બ્રહ્મને જાણી લીધું એટલે તમારામાં બધું જ્ઞાન આવી જાય. પછી તમે દરેક વિષયમાં તમારી ચાંચ ડૂબાડી શકે. આમ તો દરેક મનુષ્યના જીવનમાં આ અવસ્થા આવે છે. પણ કેટલાકમાં આ અવસ્થા સ્થાયી થઈ જાય છે. જો આપણે માંડીને વાત કરીએ તો બાળક જન્મે એટલે તે ભોજન અને તેથી અતિરિક્ત દરેક વસ્તુને સ્પર્ષ કરીને ઓળખવાનો પ્રયત્ન કરે છે. પછી ભાષા સમજવાનો અને બોલવાનો પ્રયત્ન કરે છે. પછી તમે એને ભણાવો એટલે બધી માહિતિનો સંગ્રહ કરે છે.પછી તે પોતાના પ્રશ્નો કરવાનું અને મનગમતી માહિતિ મેળવવાના પ્રયત્નો કરે છે. પોતાની માહિતિને ઠમઠોરે છે. એમ કરતાં કરતાં તે પોતાનું ભણતર પૂરું કરે છે. પણ વ્યાવસાયિક અનુભવ ન હોવાથી વ્યવસાયમાં બીજાઓના અનુભવ વિષે પૃચ્છાઓ કરે છે. એમ કરતામ કરતાં એ ૩૦ થી ૩૫ વર્ષનો થઈ જાય છે ત્યારે તેને ખબર પડે છે કે કેટલાકને તો પોતાના કરતાં પણ ઓછી ખબર છે. અને આ ઓછું જાણતા વ્યક્તિઓની સંખ્યા કે જેની તે જાણ રાખતો હોય છે તે ઉત્તરોત્તર વધતી જાય તો તે સમજવા લાગે છે કે તે હવે બ્રહ્મજ્ઞાની થઇ ગયો. એટેલે તે દરેક વિષયમાં ફ્રીસ્ટાઇલથી પાદાર્પણ કરે છે. હવે આપણે બ્રહ્મજ્ઞાની તો થઇ ગયા પણ લોકોને તો ખબર નથી. લોકોને ખબર કેવીરીતે પાડવી? એટલે આ વિષે ચિંતન અને પ્રયત્નો ચાલુ થાય છે. સંસ્કૃતમાં આ વિષે લખ્યું છે કે “ઉટપટાંગ” અને “અર્થહિન વાતો કરવી”… આંબાને તરસ્યો ભૂખ્યો રાખવો અને થોરને પાણી પાવાની વાતો કરવી. એટલે કે સિદ્ધપ્રણાલીઓને તોડવાની વાતો કરવી. તે ખ્યાતિ મેળવવાનો ઉત્તમ રસ્તો છે. અમે દેશી છીએ એટલે દેશી ઉદાહરણો આપીએ છીએ. નહીં તો રોબર્ટ રેન્જર કે મેકસીમ ગોર્કી કે એવા કોઇનું નામ આપત. સત્યં વદ, ધર્મં ચર એવી ગુડ્ડી ગુડ્ડી વાતો કરશો તો લોકો ક્યાં સુધી સાંભળશે? કુતરુ માણસને કરડે તો તે ચટાકેદાર સમાચાર કે કદાચ સમાચાર પણ બનતા નથી. પણ માણસ જો કૂતરાને કરડે તો તે ચટાકેદાર સમાચાર બને જ બને. આ વાત પત્રકારિત્વના વિદ્યાર્થીઓને શિખવામાં આવે છે. પણ આ તો એક ઉદાહરણ થયું. તમે આવા કંઈક વિષયોને ઉત્પન્ન કરીને વિવાદ સર્જી શકો. અને આ ઉપરાંત પણ એવા ઘણા વિષયો છે જે ઉપર કાળના પ્રવાહમાં કાળે માન્ય કરેલા સુજ્ઞજનોએ વિસ્તારથી ચર્ચેલા વિષયો ઉપર ચર્ચા કર્યા વગર અથવા તો અસંબધ્ધ પ્રલાપનો આલાપ કરીને એક વિવાદ ઉત્પન્ન કરી શકો છો કે જેથી પૂર્વેના સુજ્ઞજનો તમારી ચર્ચામાં ભાગલેવા અશરીરી હોવાને કારણે વિલાપ કરતા થઇ જાય. અંધારો ઓરડો એટલે શું? નાનકડો એક દિવો મોટા એવા ઓરડામાં અજવાળું પાથરી શકે છે. પણ ચમચાઓથી ઘેરાયેલા સંતઆગળ વિદ્વાન વૈજ્ઞાનિક પણ વામણો બની જાય છે. કારણ કે સંત અને તેથી કરીને ચમચામંડળ કે અલ્પજ્ઞ શ્રોતામંડળ કે જેને એવું ઠસાવી દીધેલું હોય છે કે બુદ્ધિથકી અદ્રષ્ટને સમજવાની શક્તિ સીમિત હોય છે અને તેથી આવા શ્રોતાઓની આગળ ફેલાયેલા અભિભાવક અંધકારમાં તે રજમાત્ર અજવાળું પાથરી શકતો નથી. આ અંધારા ઓરડામાં તો શબ્દોના પ્રાસ, અનુપ્રાસ, લય, વિલય અને વિરોધાભાષી સંભાષણોમાં જ શ્રોતાગણ અભિભાવુક બનવામાં માનતો હોય છે. અને તેથી જ્યારે સંતનું વિષય ઉપરનું અવિષય વ્યાખ્યાન પૂરું થાય ત્યારે ” … હા તો પછી સરવાળે શું કરવાનું એ તો સ્પષ્ટ કરો … ” એવું કોઇ પૂછી શકતું નથી. આ રજનીશભાઈ, જે પોતાને સર્વપ્રથમ આચાર્ય તરીકે ઓળખાવતા હતા, પણ પછી કોઈ તેમનાથી અધિક સુજ્ઞ જને તેમના ધ્યાન ઉપર લાવ્યા કે તમે કોઈ ભાષ્ય લખ્યું નથી, તમને સંસ્કૃત પણ આવડતું નથી એટલે તમને “આચાર્ય” કેવી રીતે કહી શકાય? ત્યારે આ રજનીશભાઈ કહ્યુ કે “હુ ફલાણી ફલાણી કોલેજ માં લેક્ચરર હતો.” આમ કહી તેમણે પોતાનું સંસ્કૃતનુ અજ્ઞાન પ્રગટ કર્યું. કારણ કે સંસ્કૃત ભાષામાં પ્રવર્તમાન પ્રણાલી પ્રમાણે લેક્ચરરને અધ્યાપક કહેવાય છે. અને આચાર્ય તો પ્રિંસીપાલને કહેવાય છે. એટલે વાણીવિલાસી, આપણા આ રજનીશભાઈએ પોતાના નામના પૂર્વગ માં આચાર્યને સ્થાને “ભગવાન” શબ્દ સ્થાપિત કર્યો. ભગવાનનામનો પૂર્વગ શા માટે પસંદ કર્યો? જો કે આમેય આ જગતમાં હમેશા પોતાને ભગવાન માનનારાઓનો તૂટો રહ્યો નથી. હર હમેશ જગતમાં મનુષ્ય રુપે વિચરતા ભગવાનોનો આંકડો ચાર આંકડામાં રહ્યો છે. શિષ્યોએ પોતાના ગુરુમાં રહેલા ભગવાનનો સાક્ષાત્કાર થયો કે તે ગુરુને પોતે ભગવાન હોવાની અનુભૂતિ થઈ તે તો તેઓ જ જો સાચાબોલા હોય તો કહી શકે. એ વાત જે હોય તે અહીં આપણા આ રજનીશભાઈ ભગવાન થયા. તેમના બધા પુસ્તકોમાં તેઓ પોતાના ફોટા સાથે ભગવાન રજનીશ તરીકે દૃષ્ટિગોચર થવા લાગ્યા. ભગવાન થવામાં એક સુખ હતું. કયું સુખ હતું? ભગવાન તો બધામાં જ હોય. ઝાડ, પાન, ડૂંગરા, નદીઓ, ખીણ, જંગલ, શહેર, ગામડું, મનુષ્ય, પશુ, પક્ષી, રાક્ષસ, કાર્ય, કારણ, સુખ, દુઃખ, એ બધું જ ભગવાન છે. ગીતામાં કૃષ્ણ ભગવાન નું વિશ્વરુપ દર્શન જોઈ લેવું. એટલે પોતાને ભગવાન કહેડાવીએ તેમાં કોઈ વાંધો પાડી ન શકે. સામાન્ય માન્યતા એવી છે કે જે વ્યક્તિ પોતાનામાં રહેલા ભગવાનને ઓળખી શક્યો તે વ્યક્તિ ભગવાન. અથવા તો જેણે યોગ, કે સમાધિ દ્વારા બ્રહ્મને જાણી લીધું તે ભગવાન. એટલે જો આપણા રજનીશભાઈ પોતે જાતે ખોંખારીને ફોડ ન પાડે ત્યાં સુધી તેમના શિષ્યો યથેચ્છ રીતે, ચર્ચા કર્યા સિવાય જે માનવું હોય તે અને અથવા અજ્ઞજનોને જે મનાવડાવવું હોય તે મનાવડાવી શકે. રજનીશભાઈ તો કશું બોલે જ શેના. પણ પોતાને ભગવાન તરીકે ઓળખાવવામાં એક મુશ્કેલી હતી. આ કંઈક વધુ પડતું હતું. આજના આધુનિક યુગ અને આધુનિક વિચારધારા સાથે બંધ બેસતું ન હતું. વળી આપણા રજનીશભાઈ પોતાને આધુનિક અને પ્રગતિશીલ વિચારધારાવાળા તરીકે ઓળખાવવા માગતા હતા. કારણ કે તેમને તેમના શિષ્યમંડળમાં માલેતુજાર લોકોને ભેળવવા માગતા હતા. રેંજી પેંજી, ગરીબ ગુરબા તેમને પસંદ ન હતા. સેલીબ્રીટીજ઼, ફીલ્મી હિરોજ઼, ફીલ્મી હિરોઈનો, જેવા લોકો અને બાપકમાઈ વાળા છેલ છબીલા લોકો, કૃષ્ણ ભક્તો, જય જીનેંદ્રવાળા લોકો, અને પોતાને વૈશ્વિક ગુરુ થવું હતું તેથી થોડા વિદેશી મૂક્તવિચરતા લોકો આવે તો સોનામાં સુગંધ ભળે. એક કાંકરે ત્રણ પક્ષી મરે. જેમ રાત્રે તારાઓ થી ચંદ્ર શોભે છે, ચંદ્રથી તારાઓ શોભે છે અને ચંદ્ર અને તારાઓથી આકાશ શોભે છે, તેમ આવા ગુરુથી બેવકુફ જેવા પણ માલે તુજાર સેલીબ્રીટીઓથી પરસ્પર એકબીજા શોભે અને બંનેથી તેમનો આશ્રમ શોભી શકે. આવી સ્થિતિમાં તર્કની જરુર પડતી નથી એની મોટી નિરાંત છે. તર્કમાં આપણે માનવું જ નહીં. બધા વિવાદોનું મૂળ તર્ક છે. માટે તર્કને તિલાંજલી આપો. તે માટે આ તર્ક કરો; જેની પાસે વધુ માહિતિ છે તે વધુ તર્ક કરી શકશે. જેની પાસે ઓછી માહિતિ હશે તે સાચો હોવા છતાં પણ હારી જશે. એટલે આમાં માહિતિઓનો જ જય પરાજય થાય છે. સત્ય તો ત્યાંનું ત્યાં જ રહે છે. માટે હે (અલ્પજ્ઞ જનો) તમે તર્કથી દૂર રહો. તમારા અંતરાત્માને જે ગમે તેને જ સત્ય માનો. આપણા રજનીશભાઈમાં સંસ્કૃતભાષાનું જ્ઞાન ઓછુ હતું કે ન હતું. નહીં તો તે એમ પણ કહી શક્યા હોત કે સ્મૃતિ ર્વિભીન્ના શ્રુતયશ્ચ ભીન્ના, નૈકેઓ મૂનિર્યસ્ય વચસ્પ્રમાણં, ધર્મસ્ય તત્ત્વં નિહિતં ગુહાયાં, મહાજનો યેન ગતશ્ચ પંથા. (હે અજ્ઞજનો, વેદો અને ઉપનિષદો, અલગ અલગ કહેછે. મૂનીઓ પણ એકમત નથી. સત્ય છે તે તો કોઈ ઊંડી ગુફામાં પડ્યું છે. માટે તમે (જેને મહાપુરુષ માનો છો) મહાપુરુષો જે કહે તેને અનુસરો. આપણા રજનીશભાઈના ઉદ્ધ્વરણો માં કૃષ્ણ, મહાવીર અને બુદ્ધ ના નામનો ઉલ્લેખ એક સાથે કશા પૂર્વાપર સંબંધ વગર થયા કરતો. જો તમારે મહાન ગણાવું હોય તો તમારે પ્રચલિત સર્વસ્વિકૃત મહાપુરુષોની વાતોને નકારવી જોઇએ. “ગાંધીની અહિંસા નિરપેક્ષ અહિંસા નહીં થી. તમે તમારી વાત તર્કદ્વારા સિદ્ધ કરી શકો જો તમારી પાસે વધુ જાણકારી હોય તો. પણ આ તો એક પ્રકારની હિંસા છે. વળી તમે ઉપવાસ દ્વારા સામેની વ્યક્તિ ઉપર દબાણ લાવો એ પણ હિંસા જ છે. એક વેશ્યા એક યુવકને કહ્યું કે તું મારી સાથે લગ્ન કર નહીં તો હું ઉપવાસ ઉપર બેસીશ. આ હિંસા નથી તો શું છે?” …. રજનીશભાઈ ઉવાચ. જો કે ગાંધીજીના પુસ્તકો, કે કમસે કમ સત્યાગ્રહ અને ઉપવાસ વિષેના પુસ્તકો રજનીશભાઈએ વાંચ્યા લાગતા નથી. જનતાના મોટાભાગના લોકોએ પણ વાંચ્યા નથી હોતા એટલે આપણા રજનીશભાઈનો વાણી વિલાસ ચાલ્યા કરેછે. રજનીશભાઈને ખબર નથી કે સત્યાગ્રહ, ઉપવાસ, સવિનય કાનૂન ભંગ વિગેરે શસ્ત્રો વાપરવાના નિયમો સુનિશ્ચિત રીતે બનાવેલા છે. તેની પ્રથમ શરત જ એ છે કે ઉપરોક્ત શસ્ત્ર ફક્ત “સર્વજન હિતાય” જ વાપરી શકાય. બીજી શરત એ કે સંવાદ માટે હરઘડી હરપળ તૈયાર રહેવું. કાનૂની સજા ભોગવવા તૈયાર રહેવું. ગાંધીજી કંઈ મૂર્ખ ન હતા કે તેમના શસ્ત્રોને ફક્ત નામ જ આપે અને તેના ઉપ્યોગના નિયમો ન બનાવે. પણ હવે આપણા રજનીશભાઈને કોણ કહેવા જાય કે તમારામાં લાંબી બુદ્ધિ નથી. વળી તેમના શ્રોતાઓ પણ રજનીશભાઈ થી ઉચ્ચ કક્ષાના તો ન જ હોય. બનતા સુધી તો તેમના થી ઘણી ઉતરતી કક્ષાના હોય. આપણા આ રજનીશભાઈ એ નિરપેક્ષ અહિંસાનો દાખલો આપ્યો. એક પાદરીએ એક વ્યક્તિનું દૂરથી પોતાની આધ્યાત્મ શક્તિથી જ હૃદય પરિવર્તન કરી દીધું. ન માહિતિની આપ લે ન ચર્ચા. આને કહેવાય નિરપેક્ષ અહિંસા. અરે રજનીશભાઈ, “જંગલમેં મોર નાચા કિસીને ન દેખા”. તમારી વાતને મૂર્ખ જ સ્વિકારશે. પાદરી કે વિચાર પરિવર્તિત વ્યક્તિ ગોત્યા જડતા નથી. અને જડે તો પણ શું? આવી તો ઘણી અગડં બગડં વાતો છે આપણા રજનીશભાઈની. … ક્યારેક તે વાતો કરીશું. એટલે જ હજારો વર્ષ પૂર્વે સંસ્કૃતમાં એક શબ્દ પ્રયોગ છે કે “પરોપદેશે પાંડીત્યં શોભનં વર્તતે”. અને તેથી જ રજનીશ આનંદ, નિજાનંદ, દિવ્યાનંદ, અત્યાનંદ, પરમાનંદ, દેવાનંદ વિગેરે વિગેરે વિગેરાનંદ ની વાતો તેમના અભિભાવુક શ્રોતાઓમાં આલાપી શકે છે. રાહુલ બાબલ્યાની “કૅટ વૉક” અને “હીઝ નેમ ઇઝ એસ કે xyz” કોને મોંઘી પડી? યુસુફખાન થી શરુ કરીને ટીપુ સુલ્તાનવાળા ખાન થઇ ને કરિના વાળા ખાન સુધીની મંઝીલમાં કંઇક ખાનો આવી જાય છે. ગણવા બેસીએ તો કદાચ આંગળીઓના વેઢા પણ ઓછા પડે. ખાનભાઈઓની ખાસીયત એ હોય છે કે તેઓ યાદ રાખે છે કે પોતે ક્યા ખાન છે. પાત્ર ગમે તે હોય … યુનીયન લીડર હોય, કે શિવાજી ટર્મીનસ ઉપર પોટકુ લઇને ઉતરતા રામખિલાવન જેવા લાગતા અને પછી થોડા વખતમાં રાકેશબાબુ જેવા બની જતા રામપ્રસાદ હોય, કે પછી મુગલે હજામ જેવા લાગતા હોય પણ શહેનશાહના પ્રિન્સ હોય, કે સનાતન પ્રેમાતુર અને અથવા પ્રેમભગ્ન દેવદાસ હોય. સાલુ પોતાનું અસ્તિત્વ પણ કોઇ ચીજ હોય છે. અને તેથી જ તમે આંખો બંધ કરીને ફિલમ જોતા હો તો પણ તમે કહી શકો કે કયા હિરાભાઇ છે. જોકે આ ખાસીયત નવા અને જુના બધાજ હિરાભાઇઓની હોય છે. પણ ખાનભાઇઓની બીજી ખાસીયત એ છે કે તેમની વિશેષતા ખાસકરીને ઓવર એક્ટીંગની હોય છે. અને તેમાં અર્વાચીન ખાનભાઇઓની ઘર કરી ગયેલી માન્યતા એ હોય છે કે અંગઉપાંગ તો ઠીક ઠીક હલવા જ જોઇએ પછી ભલે તે કસરતના દાવની સમકક્ષ લાગે. આપણા પ્રાચીન ખાન ભાઈને એવું લાગતું કે ગંભીર કે રોતી શિકલ રાખવાથી આપણે સારા એક્ટર ગણાઇશું. અને તેમને આવું ગોઠી પણ ગયેલું. પ્રેક્ષકોને પણ ગોઠી ગયેલું. હતા જ ઇન મીન અને તીન. અને બીજા હતા તેમાં ખાસ ગ્લેમર જેવું લાગે નહી એવું પીટ ક્લાસને લાગતું. પણ તે પછી સરકાર માબાપના કાયદાઓ થકી દાણચોરી ફુલીફાલી. અને આના થકી ઉત્પન્ન થતું કાળું નાણું ફાટફાટ થવામાંડ્યું એટલે દાણચોરોની પણ દાઢ સળકી કે ફિલમમાં નાણા રોકીએ તો સલામતી જરા વધુ રહેશે. અને પછી દાઉદભાઇઓનો ધંધામાં અને ફિલમના રોકાણમાં તથા ફિલમના ઉત્પાદનને સંલગ્ન થતી શરતોમાં વિકાસ થવા લાગ્યો. અને એટલી હદસુધી કે હિરાભાઇ અને અથવા હિરીબેન કોને કરવા તે પણ રોકાણકારો નક્કી કરવા લાગ્યા. સૌ કોઇ જાણે છે કે કાળું નાણું એ અરાજકતાની પ્રોડક્ટ છે. અને અરાજકતાની અનેક પ્રોડક્ટ હોય છે. જેમાં ધાર્મિક વિસંવાદ પણ હોય. એટલે હિરાભાઇઓમાં ખાનભાઇઓનો દબદબો વધવામાં માંડ્યો. અને પૈસાની લેણદેણ દેશની બહાર થાય તો સારું એવું દાઉદભાઇઓ અને તેમના મિત્રો નક્કી કરે તેથી ફિલમના શુટીંગ પણ વિદેશમાં કરે જેથી ફેશનેબલ વસ્ત્રો પણ પહેરી શકાય અને થોડો વધુ રોમાન્સ કરી શકાય. બાકી આખી ફિલમમાં રામખિલાવન થઇ રહેવામાં કંઇ બહુ મજા નહીં. “જાગતે રહો” ફિલમથી આમ તો આપણા રાજુભાઈ નારાજ હતા. એક તો “ઈસમેં તો મૈં દિખાઈ હી નહીં દેતા હું.” અને વળી ગમારનો રોલ. એ હિસાબે દેવજી ભાઈને સુખ હતું. પણ આપણે વાત કરવાની છે ખાનભાઈની કે જેમને તેમના અને તેમના “નિયર રીલેટીવ્ઝ”ના બીજા રેકોર્ડોને કારણે અને પેપરો અસ્તવ્યસ્ત રાખવાને કારણે અમેરિકાના એક એરપોર્ટપર ખોટી થવું પડ્યું હતું અને તેથી તેમના ઉપાસકો ત્રસ્ત થયેલા. પણ મૂળવાત છે “માય નેમ ઇઝ ખાન”. નામમાં શું બળ્યું છે? એમ શેક્સપીયર સાહેબ કહે પણ દુનિયામાં અને ખાસ કરીને ભારતમાં નામમાં જ ઘણું બળ્યું છે. ઘાણ્ડી સરનેમ હોય તો ગાંધી કરી દેવી. પણ એ વાત પણ જવા દો. ખાનની વાત કરીએ. કુબ્લાઇ ખાન જંગીઝ ખાન કે ચંગીઝક ખાન. ભારતમાં આ સારા ગણાતા નથી. તેઓ આતતાયી અને અજેય હતા. હવે આપણા હિરાભાઇને આ “અજયત્વ”નો તેમને સક્ષાતકાર થયો છે તેવો જનતાને મેસેજ આપવા “માય નેમ ઇઝ ખાન” એવું નામ આપે તો બેવડો લાભ મળે. ઘણા હિરાભાઇઓ અને હિરીબેનો ફિલમમાં પોતાનું જ નામ પોતાના પાત્રને આપે છે. બેવડાલાભ માટે જ સ્તો. હવે અનેક લાભ લેવા હોય તો કંઇક ગતકડાં પણ કાઢવા જોઇએ. હવે જે હિરાભાઇ ફિલમમાં પણ કામ કરતા હોય અને ક્રિકેટની મંડળી અને તે પણ આંતરરઆષ્ટ્રીય ખેલાડીઓને ખરીદીને રમાડવાની મંડળી ચલાવતા હોય તો તેમને માટે તો ગતકડાં હાથવગાં હોય જ. અને એમના વતી ભેજું ચલાવવા વાળા પણ હોય. એટલે આ હિરાભાઇને કંઇ કોઇ સરકારે મના ફરમાવી નહતી કે તમે પાકિસ્તાની ખેલાડી લેશો નહીં. પણ હિરાભાઇને કદાચ સીમાપારથી કહેવામાં આવ્યું કે ભલે તમે પાકિસ્તાની ખેલાડી ન લો, પણ એ બાબતમાં મુંગા રહો તે તો નજ ચાલે. એટલે હિરાભાઇ વદ્યા કે પાકિસ્તાનના ખેલાડીઓને લીધા હોત તો સારું થાત. હવે આવું કહે અને આપણા બાલા ઠાકરે સાહેબ મુંગા રહે તે તો કેમ જ ચાલે? જોકે યોજના પ્રમાણે તો રાજ ઠાકરે સાહેબે બોલવાનું હતું. પણ તે મોડા પડ્યા. અને તાજેતરમાં રાહુલ બાબલ્યાભાઇ મુંબઇમાં “કેટવૉક” કરી ગયેલ અને સેકન્ડ ક્લાસની ટીકીટ લઇને ફર્સ્ટક્લાસમાં મુસાફરી કરી ગયેલ, તેથી બાલાસાહેબનું મોઢું કાર્યશીલ હતું જ અને તેમણે ફતવો બહાર પાડી દીધો. ડી-ભાઇ અને ખાનભાઇ આણી કંપનીને આજ જોઇતું હતું. કે જેથી એક ન્યુસંસ તત્વ ઉમેરાય અને પ્રસિદ્ધિ મળે અને તેથી ઠીક ઠીક વકરો થાય. પણ બાલાસાહેબની વાતને લોકોએ ધાર્યાં કરતાં ઠીક ઠીક વધુ વધાવી લીધી તેથી બબાલ ઉભી થઇ. રાજ સાહેબને થયું કે “આતો ભારે થઇ”. જો મુસ્લિમોનો ખાવિંદ કોંગ્રેસ હોય તો મરાઠીઓનો હું છું. અત્યારસુધી હું બાલાસાહેબનું માન જાળવતો આવ્યો છું. આ બૉલને તો મારે જ ફટકો મારવાનો હતો. રાહુલ બાબલ્યો “કેટ વૉક” કરતો હતો ત્યારે બાલા સાહેબને મેં બોલવા દીધેલા. હવે તો મારીજ બેટીંગ હતી. બાલાસાહેબ તો આઉટ થઇ ગયેલા છે. ફરીથી શેના બેટીંગમાં આવી ગયા? ગણવા માંડો… ડી-મંડાળી (પાકિસ્તાન), ડી-મિત્રમંડળી(હિન્દુસ્તાન), બૉલી-જંગલના વાસીઓ, બાલાસાહેબ અને બાય-વિકેટકિપર તરીકે દહીં-દુધીયા તરીકે રાજ ઠાકરે. હવે તમે કહેશો કે શરદ પવાર કઇ ટીમમાં હતા? (કે છે). જેઓ તેમને જાણે છે તેમને ખબર છે. કે તેઓશ્રી બાલાસાહેબને કેમ મળવા ગયા હતા! રાહુલબાબલ્યાની કેટવૉક તેમને કેટલામાં પડી હતી?અને ખાનભાઈની સીપાઇગીરી તેમને કેટલામાં પડી હતી? શું આબધું ડી-મંડળી માટે પૂર્વ નિયોજીત હતું? આમ તો આ બધા જ પિત્રાઇ જ લાગે છે. કોણ કોને મદદ નહીં કરે તે સંશોધનનો વિષય છે. બીજેપીના લીડરોએ આમાં ચંચૂપાત નકર્યો તે ડાહપણનું કામ કર્યું છે. તેમના એક નેતાએ ચેતવણી આપેલ કે પોલીસ ફોર્સને કોઇના મમત ઉપર જવાના (રાહુલ બાબલ્યાની કૅટ વૉક અને એસઆરકે “મારું નામ છે મંકી” કે જે હોય તે સરકારી ખર્ચે રક્ષિત કરવાના) હેતુને પરિપૂર્ણ કરવા માટે તેમની તરફ કેન્દ્રીત કરીએ તો આતંકવાદીઓ પોતાની યોજનાઓનું કામ સરળ રીતે કરી શકે છે. અને જુઓ પૂનામાં શું થયું? કોંગ્રેસની ફીશીયારીઓ નરાતર ખોટી પડી. આ બધી જ ખોટ કોને માથે છે? ત્રીનેત્ર એ સનાતન ધર્મીઓ માટે જાણીતો શબ્દ છે. વિશ્વદેવ જેને ઋગવેદમાં વર્ણવવામાં આવ્યા છે. તેમને ત્રણ નેત્રો છે. સૂર્ય, ચન્દ્ર અને અગ્નિ. આપણે ચન્દ્રના અજવાળામાં જોઇ શકીએ છીએ. હવે “જોવું” એ શબ્દનો અર્થ જાણવું કરીએ તો ચન્દ્રના અજવાળામાં આપણે જે કંઈ જોઇએ તે સ્પષ્ટ ન હોઇ શકે. અને આપણા મનને આપણે મદદમાં લેવું પડે. અથવા અજાણતાં પણ આપણે તેમ કરીએ છીએ. તેથી ચંદ્ર એ મન છે. “ચન્દ્રોમા મનસિ જાતઃ” એમ પણ કહ્યું છે. તેનો અર્થ એ પણ થઇ શકે કે ચંદ્ર આપણા મન ઉપર અસર કરે છે. સૂર્યના અજવાળામાં આપણને બધું સ્પષ્ટ દેખાય છે. મતલબ કે જોઇ સમજી શકીએ. પણ આપણી વાત તૃતીય નેત્ર વિષેની છે. જ્યારે સૂર્ય પણ આકાશમાં ન હોય અને ચંદ્ર પણ આકાશમાં ન હોય ત્યારે આપણે અગ્નિથી કામ ચલાવીએ છીએ. વળી અગ્નિ આપણું અન્ન રાંધે છે અને આ પક્વ અન્ન આપણને આનંદથી જીવાડે છે. અગ્નિ એ બ્રહ્મમાંથી ઉત્પન્ન થયો. તેથી તેને “બ્રાહ્મણ” કહેવાય છે. અને તેથી વૈદિક ધર્મને “બ્રાહ્મણ ધર્મ” કહેવાય છે. અગ્નિને ઘરમાં “દીપ”ના સ્વરુપમાં રાખવામાં આવે છે. તેથી તે “ગાર્હપત્ય” છે. આ ત્રીજું નેત્ર અગ્નિ એ શું નથી? અગ્નિ એ જ્ઞાન છે. જ્ઞાન એ ત્રીજું નેત્ર છે. પણ જ્ઞાન એટલે શું? પંચેન્દ્રીયો થકી કે કંઇ જોવામાં આવે અને મગજમાં સંગ્રહવામાં આવે અને તે ઉપર મનન ચિંતન કરી સમજવામાં આવે તેને જ્ઞાન કહેવાય. જ્ઞાન શું કરે છે? જ્ઞાન એ મનુષ્યમાં પ્રજ્ઞા ઉત્પન્ન કરે છે. આ પ્રજ્ઞા એટલે સાચા નિર્ણય કરવાની ક્ષમતા. સંબદ્ધતાની પ્રજ્ઞા, પ્રમાણભાનની પ્રજ્ઞા અને પ્રાથમિકતાની પ્રજ્ઞા. આ ત્રણે પ્રજ્ઞાઓ સમાજનો સામાજીક અને વૈજ્ઞાનિક વિકાસ કરે છે. ટૂંકમાં સામાજીક ઉન્નતિ માટેની ચર્ચાઓ, સંબદ્ધતાની પ્રજ્ઞા, પ્રમાણભાનની પ્રજ્ઞા અને પ્રાથમિકતાની પ્રજ્ઞા ની પરિસીમામાં થવી જરુરી છે. આ તૃતીયનેત્ર એ જ્ઞાન સ્વરુપ છે. અને સર્વ સમસ્યાઓનો સંવાદ આવકાર્ય બનાવેછે.